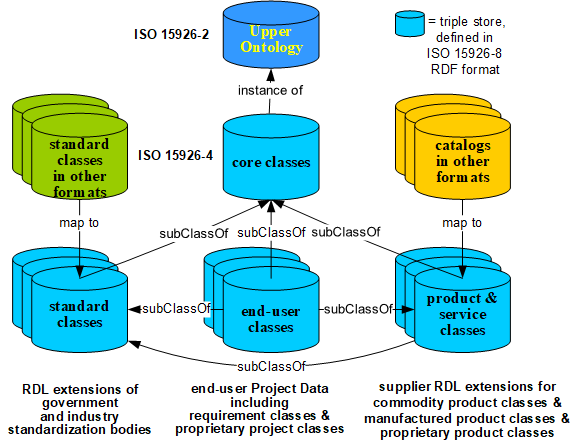 ISO 15926 is modeled in a data-driven fashion, using templates that have "Roles", and where those Roles make reference to the URI of objects that have been declared as instances of the Part 2 entity types. Some of these instances are of global interest and some of local interest. The formers are stored in the ISO 15926-4 Reference Data Library, the latters in local extensions of same. Click here to see it in the browser. And click here for an index of all Artefacts. Below is the list of Part 2 entity types of which instances are, or will be, stored in the RDL. ClassOfAtom All entries in the periodic table of elements. ClassOfClassOfComposition use in local RDL extension to group standard composition info. Note that the RDL is not yet flawless and never complete. This is Work-In-Progress. The entity types marked in green are likely to be used when defining the RDL as an ontology. In total the RDL has 21247 active classes now. You can browse through a working library here. In total these RDL extensions have 17734 active classes now. Some of these extensions contain a small set of classes, as they were required on projects, and others, such as the one from ASME, contain many classes. DISCLAIMER - In any cases where the definition of a class is different from the original standard, the latter prevails.